In one day, two of America’s most heralded athletes in their respective sports, were faced with performance-enhancing drugs reports that could have tarnished their careers. However, it seems that these two stories have completely different public outlooks. Alex Rodriguez finds himself in the spotlight of a PED case for the second time in his career. Rodriguez has already confessed to using PEDs with the Texas Rangers from 2001-2003. Now he is being accused of cheating again in a recent Miami New Times story. The story shows records of Rodriguez buying PEDs from 2009 to last season. Through his PR staff, Rodriguez has declined the accusation, saying he has never been treated by the man behind the scheme, Anthony Bosch. No matter what A-Rod says, he already has a public perception that he is a cheater and a liar. The New York Yankees have clearly had enough. Rodriguez has caused loads of drama in the Big Apple and enough seems to be enough. They cannot do anything with A-Rod’s massive contract until the MLB’s investigation is finished, but multiple reports have stated that the Yankees will look to void his contract if possible. Simply put, A-Rod is a narcissistic drama queen, who lies and cheats in the public eye. On the other hand, Ray Lewis is the complete opposite. He is loved by fans and respected by players. Lewis is seen as the ultimate warrior on the gridiron and one of the greatest leaders of all-time. All that could change if a Sports Illustrated report on Lewis taking a banned substance to return from his torn triceps sooner is true. Mitch Ross, co-founder of Sports with Alternatives to Steroids (SWATS), told Sports Illustrated that he supplied Lewis with deer-antler spray. Deer-antler spray contains (IGF-1), which is a banned substance in the NFL. Lewis denied the allegations and refused to talk about them at the Super Bowl’s media day. He has never tested positive for a banned substance. So, what should we think of his simple “next question” response? The past tells us the situation will be nothing compared to what A-Rod or any other baseball star would deal with. Football players who have been accused of or tested positive for PEDs, have had their cases shoved under the rug. We want to see them bashing skulls with other players and continue to be our modern day gladiators, so why bother right? 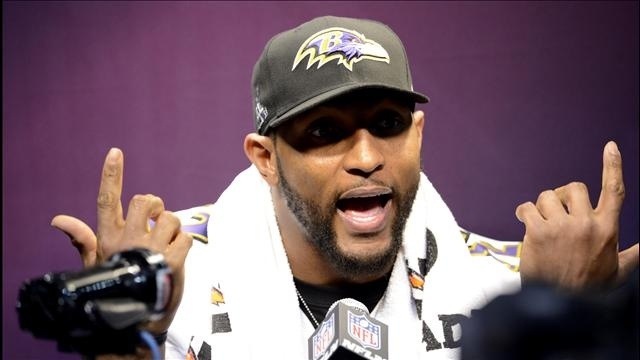 When Ray Lewis is illegible to be enshrined into the football Hall of Fame, will constant talk about an accusation of cheating haunt all the way to Canton, Ohio? Will he face the scrutiny that Barry Bonds or Roger Clemens faced this year? How about those that were just suspicious to voters like Craig Biggio, Jeff Bagwell and Mike Piazza? The simple answer to all these questions, is no. Players accused of and even ones that have tested positive for PEDs in the NFL have gone on to play in Pro Bowls with their stories simply forgotten about. If players in the NFL are juicing, then they will continue to be bigger, faster and stronger. Sounds entertaining, but the NFL’s problem with head injuries certainly won’t go away. No big deal though right? The thought of a baseball traveling a little farther, because a player juiced is clearly a way bigger issue. Innocent until proven guilty should still be the case with Lewis. I hope that is what happens, but the fact that there is a definite double-standard with these two cases, is wrong and needs to end.